I have been battling with the idea of purchasing a few Systainers so that I can use them with a hand truck to get my tools on and off the jobsite easier for a few years now, but the pricing always kept me away. Then out came the L-Boxx from Sortimo, and it popped into my mind as a possible solution. The L-Boxx then became the front runner when Bosch made them more readily available here in the States. However, now it looks like DeWalt's Tough System is the ideal storage/transport system for my needs. The Tough System is similar to the Systainer system in the fact that both systems offer stack-ability, but to me the Tough Systems takes the lead with its great L-cart (hand-truck) integration. With the DWST08201 L-cart the three different size Tough System boxes don't just rest on the tongue, but they can actually float above the tongue by using brackets on the L-cart. This brackets will not only prevent you from accidentally dumping your boxes, but it also allows users to use the the L-cart to move jobsite materials and transport your tools at the same time. Imagine having your air compressor on the tongue, then a Tough System box above it housing your nail guns and hoses. The L-Cart can handle materials up to 260 Lbs, so you can really load it up. Most importantly the L-cart has the ability to lock all of the boxes to the cart with a single lock. The Tough System boxes also offer a few great features that set them apart from their competition. The first is a water seal in the lid that protects you tools from the outside elements. This means you can keep the boxes in the back of your truck during a flood and not have to worry about messing up your electronics. The boxes themselves are also lockable, something the other brands are missing. Each one of the three boxes also offer something different. The Smallest DWST08201 offers a briefcase style handle which makes it perfect for hand tool storage. The midsized DWST08203 comes with a deep removable tray which is designed to fit a cordless tool, battery, and charger. The large DWST08204 provides removable vertical storage for easy access and organization. The Toughtsystem boxes are priced a bit less then the Systainer or the L-Boxx, but the line is still covered by a limited lifetime warranty. The line will be available beginning in July 2011 and will cost $45 for the DWST08201, $55 for the 203, $65 for the 204, and $160 for the 210 L-cart. 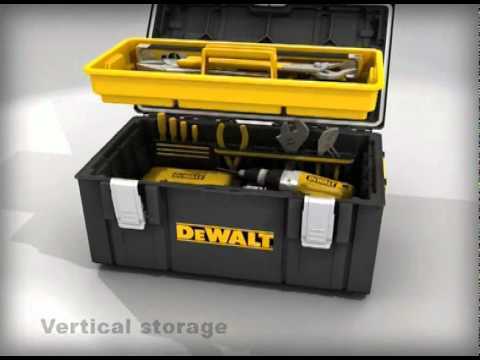 I found a video made for DeWalt UK that better shows what the Tough System can do. Be aware that the UK version might have some differences.